In this post, we examine five of the best-selling Caron Cakes yarn, provide some pics of finished knits along with some video tutorials. Carn Cakes yarn is a multipurpose yarn frequently used for knitting and crocheting. Because it has a versatile worsted weight, it’s is ideal for garments, accessories and home décor projects (Source). Are you planning to crochet eye-grabbing cardigans, jumpers, accessories for the entire family or for your home projects? 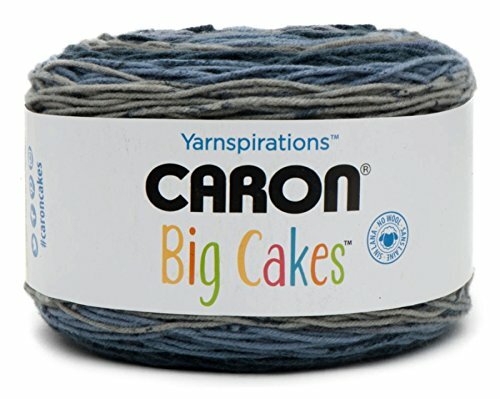 If yes, you should look no further than Caron Cakes yarn. You can use this multipurpose yarn for almost any project – from crocheting and knitting of garments to crafting various home décor beautifiers and more. Each ball comes with five bright colors that are available in an eye-catching range of vibrant shades. If you want to add an entire rainbow of colors to your yarn stash, go for Caron Cakes yarn and you will be surprised by the vibrancy for sure. Different shades: Caron Cakes yarn comes with an enticing concoction of a wide range of shades, and you will get five different colors in one ball. Apart from being perfect for creating big striped blankets, it is ideal for people, who usually dislike sewing in the ends when changing colors. Untangling: Before you buy the product, you should remember one thing though – when trying to get the tail out of the knot, the mass coming out will be almost the size of a softball. So, you would need to spend a substantial amount of time to untangle the giant knot. You can watch this video to learn about how you can find the yarn ends with minimum effort. Cutting: Also, in order to reach a different color, you would need to cut the short bit of the beginning color off. If you are new to working with an acrylic-wool blend, you may have to face initial hiccups in straightening the yarn out and making it perfectly drapey. Washing: In addition, you would need to hand wash it in cold water as friction and heat will cause felting. 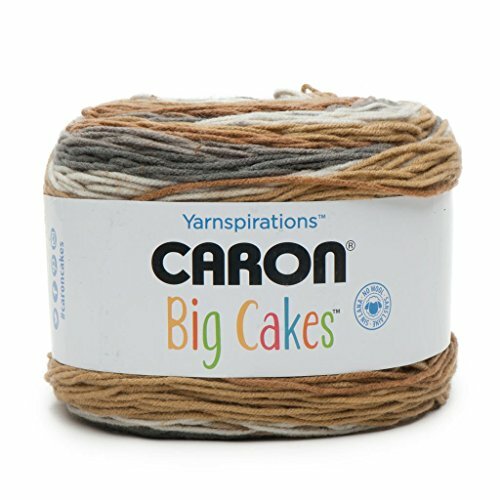 If you are looking for chunky and abrupt color changes together with easy center pull and incredible yardage (383 yards per ball), Caron Cakes yarn is the thing you should try your hands on. Just remember that if you are allergic to wool, it may feel a little itchy. Availability: Though Caron Cakes yarn is a Michaels exclusive, there is a range of other online stores available when you can find this multipurpose, self-striping product. The content of this yarn is made of 80% acrylic and 20% wool, which makes it super soft. Thanks to its versatile worsted weight, you can use this multipurpose yarn for creating a variety of colorful things. Whether you want to crochet patterns, or knit a beautiful piece out of this self-striping yarn, or craft beautiful pieces to wear and jazz up your home by blending crochet and knit patterns, you can do it all. From slouchy crochet beanie and crochet scarf to top-down knit pullover, triangle patchwork crochet blanket, boho crochet wall hanging, and zig-zag knit shawl, there’s almost an endless world of items and patterns to be inspired while working with Caron Cakes yarn. The only downside, according to some people, is that color runs are quite long with abrupt changes. So, perhaps it is not the most suitable yarn for someone who loves to determine precisely where color changes would occur in a project. Yet, the lure of Caron Cakes yarn is hard to resist for many as it offers multiple colors of yarn in a single ball. 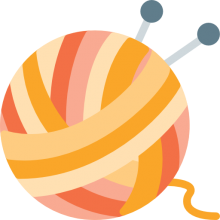 Thus, you can avoid buying multiple yarn balls, especially when you are working on a colorful project. The colors work together nicely as they have been selected by a designer. So, it again saves you on guess-work if you are not confident about choosing colors. If you are new to knitting as well as to Caron Cakes yarn, you may find it little difficult to create patterns using the yarn. However, a wide variety of simple yarn patterns are available on various sites online, using which even beginners can create beautiful products of all types. A pattern may be worked in rounds (worked around to create a tube without any seams, like a hat), or in rows (back and forth to create a flat piece like an afghan). Whatever way a pattern is to be worked upon, you must start with making a slip knot on the hook. You would not find this anywhere in a pattern guide as it assumes you know that already. Apart from this, there are lots of abbreviations used in defining the method of making patterns. Just do some research online and you will get a good hang of it. And once you do, you can try making these gorgeous patterns using your Caron Cakes yarn. When Caron Cakes yarn came out in 2016, it took the world by storm and since then, lots of reviews have been written. 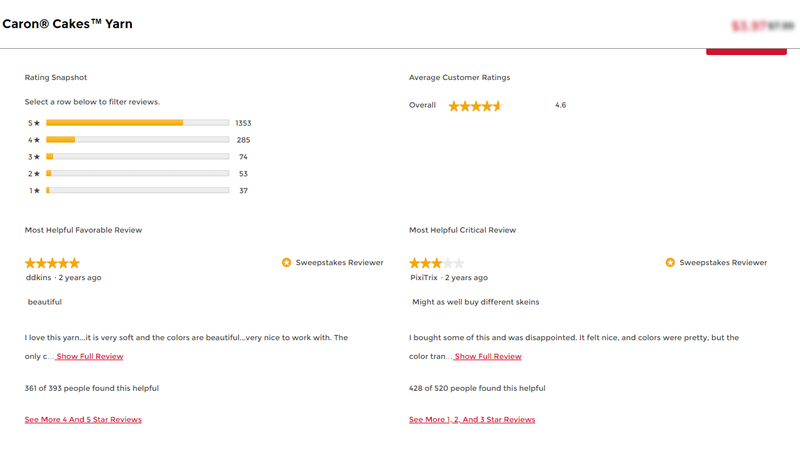 If you spend some time online going through those reviews, you will find them to be mostly positive though you may come across some small complaints as well. 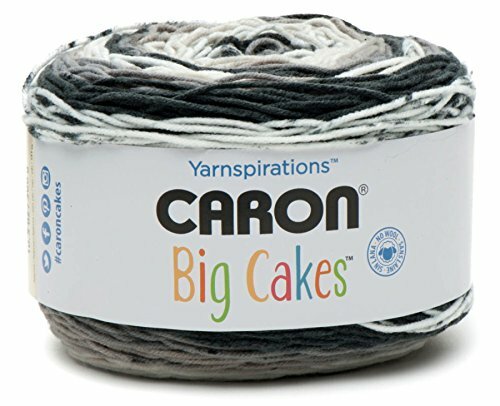 Since reviews usually happen to be subjective by nature, here is some factual information that would help you decide whether Caron Cakes yarn is best suited for your project. Factors that appear to be beneficial for most crafters include its large volume, availability in over 25 shades, presence of wool that offers some natural fiber in the yarn, and a diverse range of patterns that can be used to create cardigans, jumpers, blankets, caps, beanies, eye-popping pieces of home décor, and much more. But a handful of users complain of knots and about the “synthetic” look and feel of the yarn. 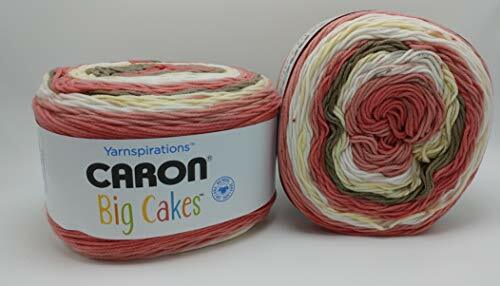 Even though Caron Cakes yarn contains wool, the final product may appear like something made of acrylic as it’s a blend of 80% acrylic and 20 %wool. 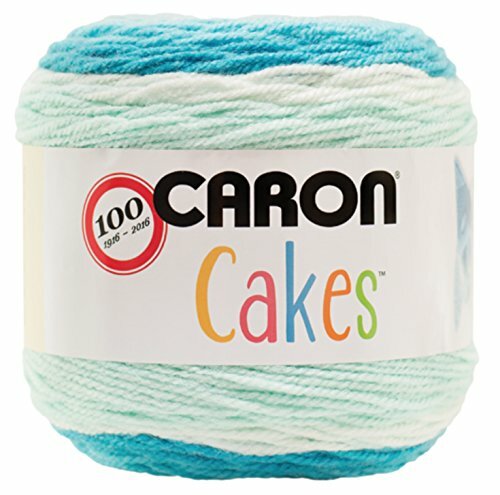 Caron Baby Cakes is a spin-off from the actual Caron Cakes yarn line. These cakes are smaller balls made available in non-wool materials like 82% acrylic and 18% nylon, thus making them soft on sensitive skin and easier to care for. These balls are available in traditional baby shade ranges ideal for your little ones. By replacing the brilliantly bright colors of Caron Cakes with soothing and adorable pastels, Baby Cakes manage to bring brilliantly blended color mixes for crafters. In case you are planning to make baby garments, blankets, toys, and accessories, this machine washable and dryable yarn should be your best bet. In winter, a majority of us like munching on tea cakes accompanies by our favorite blend of tea. Caron Tea Cakes are as refreshing as your favorite snack that accompanies your hot beverage. Made of a wool-acrylic blend that’s warmer, this yarn collection is available in a subtle and stylish range of color combinations with a lovely heather effect that draws inspiration from celebrated tea blends of the world. And thanks to the yarn’s chunky weight, you can create blankets and sweaters pretty fast with it. If you are ready to get started with a crochet tea cake shawl, you can get the pattern here. So, this winter, get ready to play mix and match in beautiful stripes of Caron Tea Cakes collection. Though there are some similarities between the brands like similar colors, abrupt color changes, softness of the yarn etc, they come with some obvious differences too. First of all, when it comes to size, Caron Cakes weigh in at 7oz and 383 yards per cake while Sweet Rolls weigh in at 5oz and just 245 yards for each cake. It makes a good difference if you’re looking to use only one skein for a small project. If you’re allergic to wool, Sweet Rolls should be your choice as it’s 100% acrylic. Overall, both are kind of vibrant and colorful yarns worthy of being added to your yarn stash. However, your choice should be based on how loosely you knit or crochet, and the pattern you’re using. Unlike the acrylic-wool (80%-20%) blend of Caron Cakes, Bernat Pop! is 100% acrylic. When it comes to size, Bernat Pop! weigh in at 4oz and just 280 yards for each cake, while Caron Cakes weigh in at 7oz and 383 yards per cake. According to some crafters, Bernat Pop! has a slightly squishy feel (though it isn’t a problem – they say). Though Pop’s gauge is 4 medium (which is the same as Caron Cakes), it is a tad thicker than normal medium weights. You may call it the beefier cousin of Caron Cakes. However, the abrupt transition between colors is a big complaint against Pop. Several crafters say they don’t like the abrupt color changes. Finding bleed spots here and there that are unpleasant to the eye is another grievance against Pop. This becomes especially disturbing when you are working with lighter colors as these bleed spots become more visible on them than their darker counterparts. Some crafters rue that finding bleed spots throughout the cake mars their otherwise lovely creations. According to some crafters, Bernat Pop! has a slight roughness to it and isn’t extremely soft, unlike Caron Cakes.